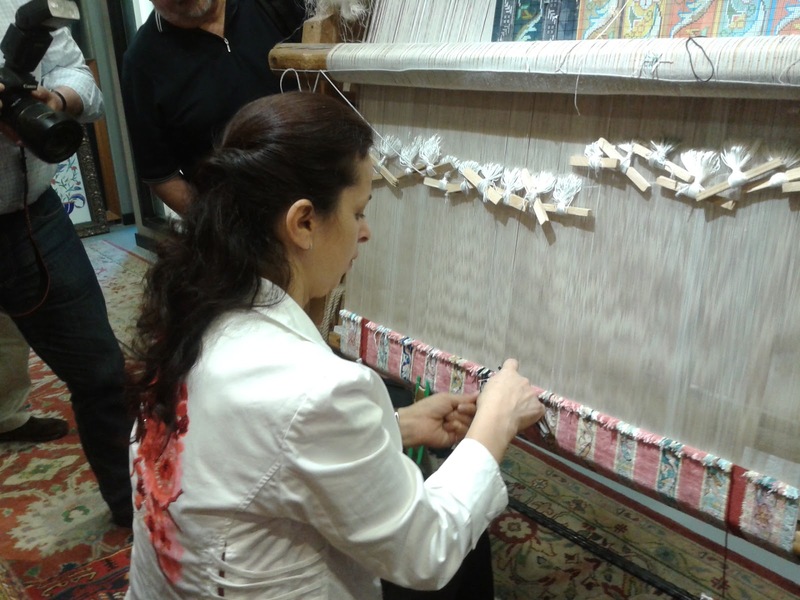 Today we pay a visit to the beautiful showroom of the Nakkas carpet manufacturer and dealer. We're greeted by a representative of the firm who speaks excellent German, and who shows us a woman weaving a silk carpet. The threads are dyed with dye produced by Bayer, the company I get most of my English students from! The dyes are weather and color-fast. He tells us that these weavers have to be trained, but that any young woman who weaves carpets will have received training in her home. The progress she makes is very slow – it would take a year and a half to weave a 1x1-1/2 meter carpet with ten knots per centimeter. Carpets vary, we learn, by the knot technique and by the number of knots per centimeter. The higher the number of knots, the finer the carpet. Silk threads make a more lustrous carpet with more sheen, but wool can also make a beautiful carpet. He shows us angora wool gathered in the warm months, when the sheep is outdoors and not lying in a muddy stall, dirtying his fleece. He says that the term “angora” for the goat that provides this wool comes from “Ankara”, the origin of this goat. We learn about the different regions these rugs come from. Armenia rugs are geometric, with stripes or angled patterns. 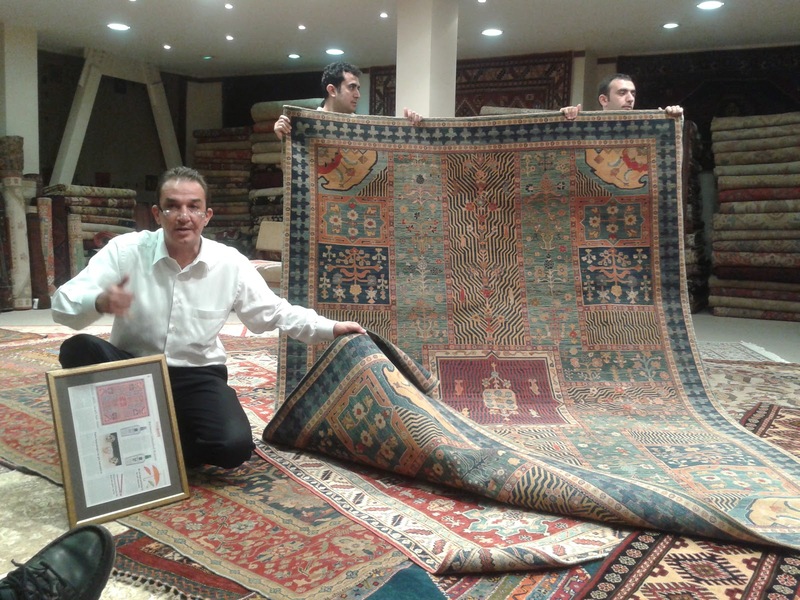 Hereke rugs have pictures, like the “tree of life”, which he shows us. We meet the designer of one of these beautiful carpets – he has won an award for his design, which include a river and the tree, a typical Muslim theme which we’ve seen in paintings, wall hangings and in mosques. 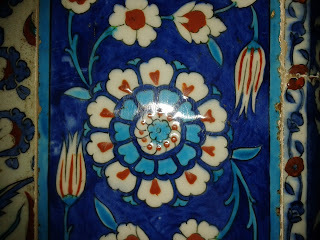 Some of the rugs we see have been made with natural dyes such as saffron, indigo and pomegranate. “It’s the money,” I reply. “I simply can’t afford one of these carpets.” Which is the truth. I’m not sure all the carpets they sell have been made with double knots, but I learn that all Turkish rugs are made this way. Double-knotted rugs last forever and don’t fray. If I had loads of money, I would certainly buy a large double-knotted silk rug. After our salesman is satisfied that I don't intend to buy, he suggests that I go upstairs to the terrace, where I can enjoy a stunning view of Istanbul. I follow his advice,and am overwhelmed to see the blue mosque so close-up. “Don’t miss the basement,” says Harun as he sees me head upstairs. 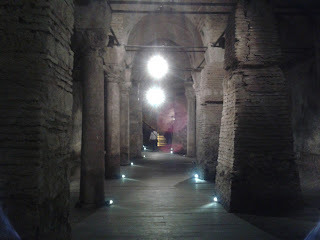 “The building is built over a Byzantine cistern.” So after gazing at the brilliant Bosphorus and admiring the best views yet of the monuments we have been admiring, I walk down to the basement, where there are the same Corinthian columns lined up in straight lines, exactly like what we saw before at the Basilica Cistern. Here, you can smell the mold, though, and there is very little water in the cistern. I read that this cistern stems from the sixth century A.D.
We ride in the bus a short distance after our carpet exhibit to yet another, our final mosque of our sojourn in Istanbul, the Rüstem Pasha mosque. This mosque was designed by Sinan, who built all of the other mosques we have seen except the Hagia Sophia, his model, which was originally a church. 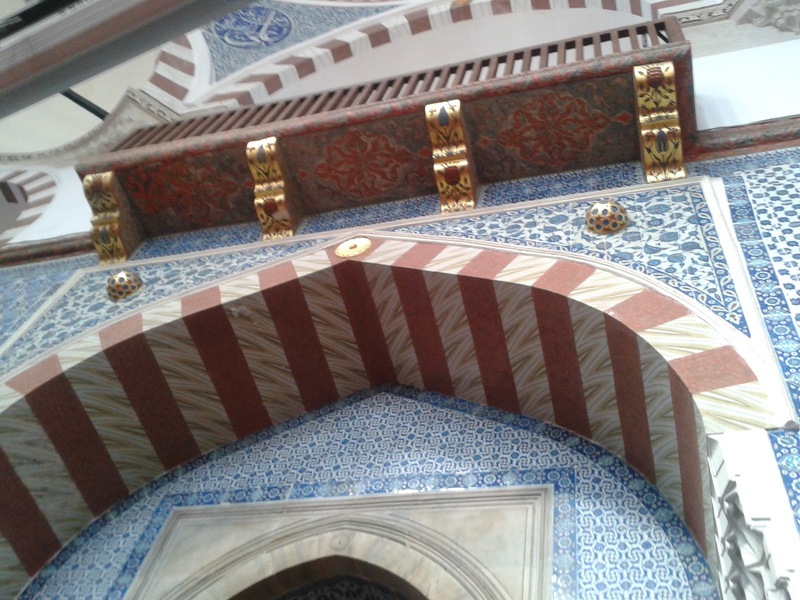 This mosque is filled from top to bottom with gorgeous hand-made blue tiles. This is much more of a blue mosque than the one named so. 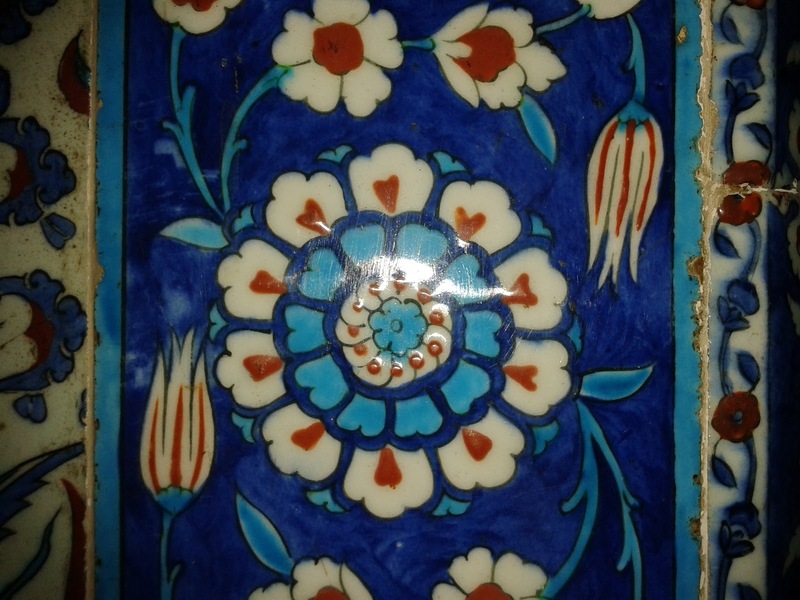 Harun says that Rüstem had unbelievably good kismet – a word that seems synonymous with fate or karma. Rüstem managed to live a happy, fulfilled life, not seeking to outdo his master, the sultan, but rising on his own to enormous wealth. People tried to discredit him, but he always foiled them, rising above their tricks. My guidebook describes him in less favorable terms. It says that he and Roxelana, Süleyman’s wife, plotted to turn the sultan, Süleyman, against his favorite son, Mustafa. The book says they succeeded in getting Süleyman to order Mustafa to be strangled. We walk to the edge of the new mosque and listen to the call for Friday prayers. It is so beautiful, and the few moments of stillness, listening, bring me closer to God. I stand there, eyes shut, smelling chestnuts roasting and coffee, feeling the hot sun. I thank God for all of this, and bless the people in the group. I love the way Harun talks about God and the beliefs of the Muslims. Harun has said something not quite accurate about Christianity, however, and this bothers me. He says that Christians and Jews don't believe in work as a means of glorifying God. So, the first moment I get a chance, I show him 1 Corinthians 10: 31 – “Whether you eat or drink or whatever you do, do it all for the glory of God.” I just happen to have an English translation of the Bible stored in my android phone. Harun has told us not to be misled by the stylishly dressed, forward-thinking people of Istanbul. He says, "Don't think these people are not devout Muslims, just because they don't necessarily have their heads covered, or you see their teenagers strolling down the Istiklal Cadessi hand in hand at night. Just because you don't see them stopping everything to pray doesn't mean they don't pray. When you see wine and raki here in all the restaurants, it doesn't mean the people drink alcohol every day. These are people of deep faith and strict morals, who go to the mosque regularly." He goes on to tell us that Istanbul, with its mushrooming population of poor Turkish people streaming in from the country to find work in Istanbul, faces many cultural clashes between the classical urban Istanbulians and the newcomers. 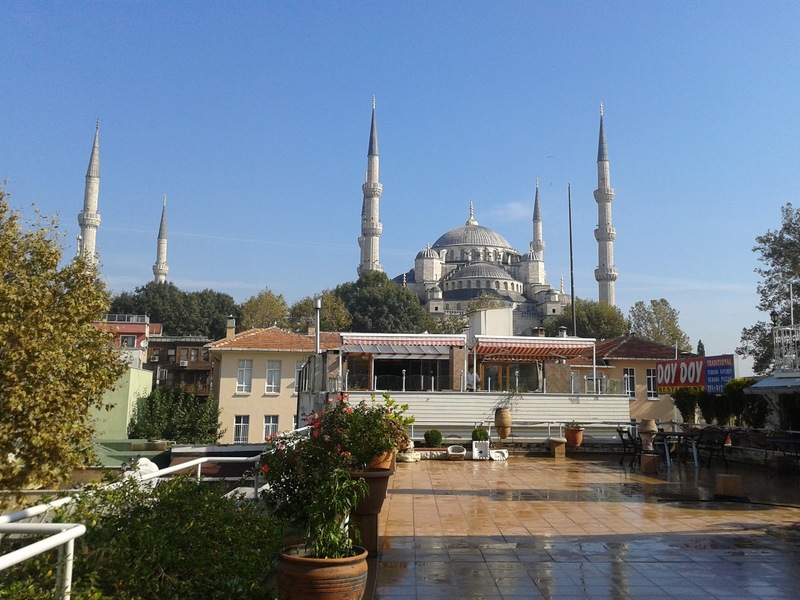 There are just as many problems trying to integrate these differing approaches to faith and life here in Istanbul as there are in Germany, which is also struggling to integrate Turkish and other immigrants into modern Germany. I take note of what Harun says, but I am not convinced. I still think the people we've seen in Egypt appear more devout. 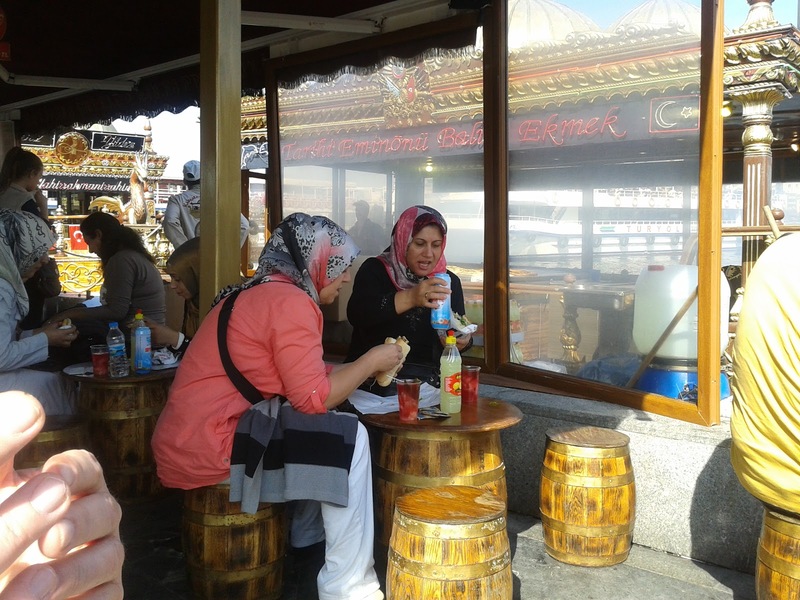 In Istanbul, we see many Turks drinking alcohol. We hear western music as well as Turkish blasting from the discos. Orhan Pamuk says in his book Istanbul that his family and many other wealthy people in Turkey were nonbelievers. Atatürk, the man responsible for transforming this country in the early twentieth century into the modern, forward-looking nation it is, belonged to no religion at all. He said, "I have no religion, and at times I wish all religions at the bottom of the sea. He is a weak ruler who needs religion to uphold his government; it is as if he would catch his people in a trap. My people are going to learn the principles of democracy, the dictates of truth and the teachings of science. Superstition must go. Let them worship as they will; every man can follow his own conscience, provided it does not interfere with sane reason or bid him against the liberty of his fellow-men." I have found this quote in the link above, and it can be found in Ataturk : The Biography of the Founder of Modern Turkey (2002) by Andrew Mango. Atatürk created Turkey into a secular democracy devoid of sharia law, into a nation that has written the death penalty out of its constitution. I believe that his spirit is still strong in Turkey, despite the increase of traditional Islam which you can see everywhere as well. The young women are much more modestly clad than those in Germany, but they fit right into the rest of Europe and the Western world. Young men are all wearing jeans. Commerce and consumption appear to be very much a part of life here. I don't know, of course, what is going on inside the hearts and minds of the millions of people inhabiting this city. To me, living in a place that is not radical would feel a lot better than being around religious fanatics. Harun tells us the crime rate is quite low in Istanbul. It looks as though tolerance is quite high. I believe it is possible to be spiritual, to be connected to God from the core, through to every pore in one's body and mind. In fact, I believe those most deeply connected with their Source are the ones who are so connected, they have learned to live in love and harmony with others. I am not afraid of spiritual people who are tolerant. I hope I am one of those. I welcome others who live and think this way. It the fanatics who want to impose their way upon others who cause me concern. 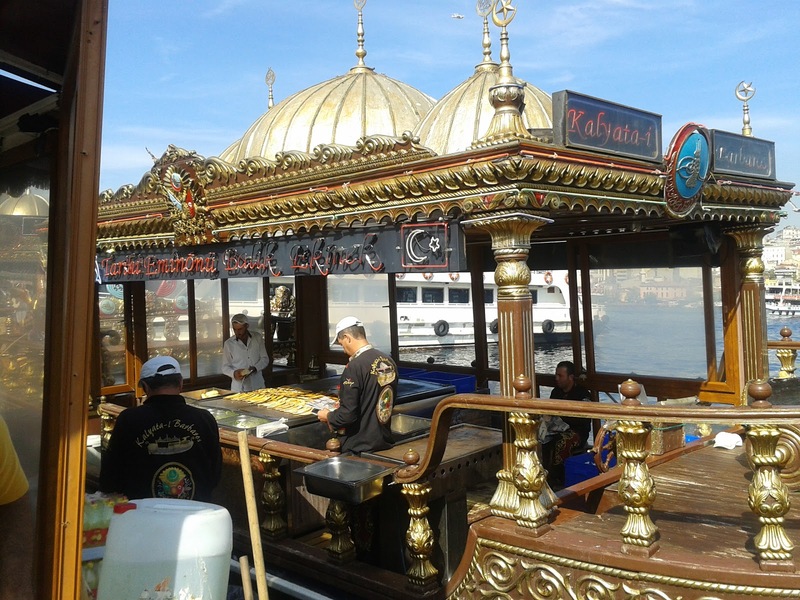 For lunch, Peter and I eat fish sandwiches near the New Mosque and the Egyptian Market - on the shores of the Golden Horn. This is a charming location to eat lunch. The customers are on solid, firm land, whereas the fish sellers fry the fish from boats, rocking along with the movement of the water. Later we shop in the Egyptian market, where we can buy all the wonderful spices we bought in Egypt earlier this year. We're already running out! 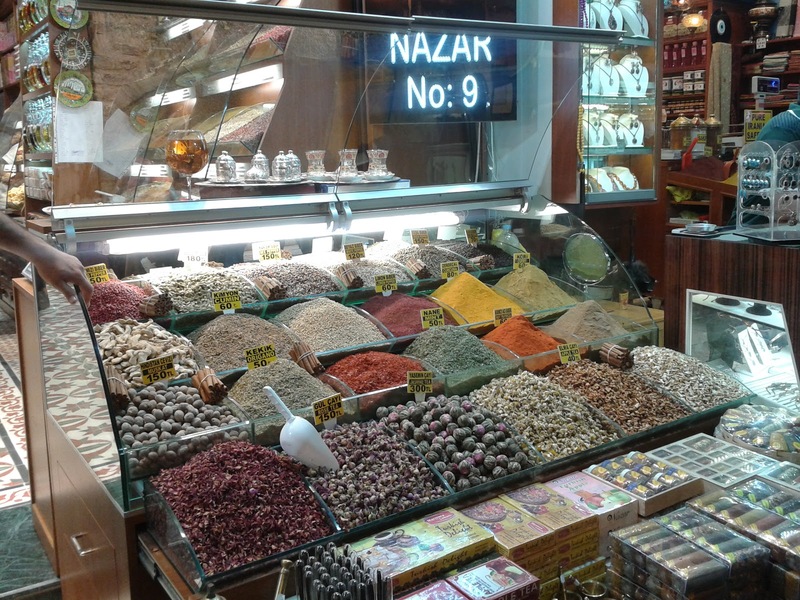 The spices here smell great, but not as intensely as those in Aswan, the best market I have ever seen for spices. 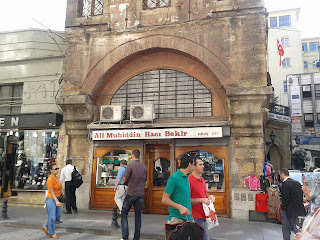 We also buy some Turkish delight - lokum - at the Haci Bekir, a shop near the New Mosque, to bring back to Germany. Harun says this is the best shop in Istanbul for Turkish delight. He has shared cinnamon and rosewater flavored lokum - both of them delicious, so we choose the same flavors, among the many on offer. 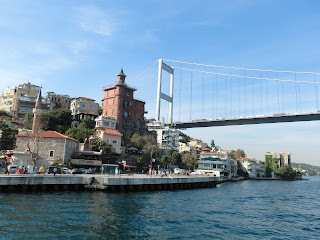 For the remainder of the afternoon, we enjoy a peaceful, beautiful boat ride on the Bosphorus. Harun has hired a boat just for us. The warm sunlight comforts us as we think about returning to colder climes tomorrow. And later, dinner in the “Fish Point” Restaurant on the Galata Bridge, looking out in the evening darkness at the Topkapi Palace lit up in the distance. Most of us have sea bass – and a host of different meze. We have been a rather quiet, introverted, yet harmonious group. By now, we all enjoy each other and are sorry to part. We are all a bit sad about going home, leaving this wonderful, vibrant, sunny city for cold, rainy, wet Germany. I intend to come back – next time with our son and his girlfriend in tow. They would love the Istiklal Cadessi, the pedestrian zone filled day and night with thousands of young people. This must be the liveliest city I have ever seen, except possibly New York City. It is a lively, peaceful, vibrant city. We must come back.